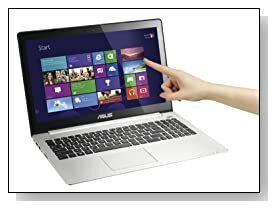 ASUS Vivobook V500CA-DB71T is a slim mid-range priced touchscreen 15.6 inch laptop with the great performance and speed of a Haswell i7 processor and the multitasking capability of a generous 8GB RAM. It looks modern and elegant, feels durable and solid, performs well in most tasks so it is a good all-round computer you will enjoy. It has an Intel Core i7-3537U 2.0GHz, 8 GB SO-DIMM DDR3 SDRAM and 500GB Serial ATA at 5400RPM hard drive as well as a Cloud based 32GB Asus WebStorage to have access to all your files wherever you are.. It doesn't have a solid state drive installed but can wake up from hibernation mode in a couple of seconds by Super Hybrid Engine II. Operating system is the 64 bit version of the latest Windows 8. 15.6" LED backlit HD touchscreen at 1366x768 pixel resolution with Intel HD Graphics 4000.. Display and graphics quality are more than sufficient but the screen is a little on the glossy side and reflective which may make it harder for you to work outdoors . Asus Vivobook V500CA uses the SonicMaster Lite technology and has larger than normal speakers, so it offers clear and loud sound with deeper bass. ASUS AudioWizard gives you options to choose between game, movie and music modes depending on your preferences. Black stainless steel premium brushed metallic texture and hidden hinges design Asus Vivobook V500CA weighs just 4.6lbs and is only 0.80 inch thick but still comes with a few connectivity ports: 1 x Audio jack combo, 1 x VGA port, 1 x HDMI port, 1 x USB 3.0 port, 2 x USB 2.0 ports, 1 x RJ45 as well as 802.11 b/g/n, Bluetooth 4.0, SD card reader and a HD Camera. Its lithium ion battery gives you up to 5 hours of battery life in average use and your data is totally safe with auto back-up function as they will be saved when the battery level falls below 5%. Pros: Chiclet keyboard with numeric keypad - Responsive Touch Screen - HDMI and USB 3.0 ports - Powerful 4th generation i7 processor - 8GB memory - Great audio and video quality - Beautiful design. Cons: Glossy reflective screen - Windows 8 operating system for some, but this is a touchscreen so it is fun to use with Windows 8. Conclusion: Asus Vivobook V500CA-DB71T is an adequate, decent and a nice looking laptop for its price. 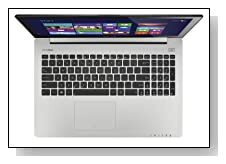 It looks exactly like an Ultrabook but as it does not have a flash storage or an SSD, it doesn't classify as one. Having said that the responsive touchscreen and Windows 8 go great together on this Asus. Looking at all the nice features it has and the trust you get from the well-respected Asus brand, it is well priced, indeed.